You may know those 5 armed, star shaped things hanging out in the intertidal as “starfish”, but since they’re not fish, they are more suitably called “sea stars”! Of the 2,000 species of sea stars worldwide, approximately 40 of them live in bc waters. While exploring the rocky shores of Clayoquot Sound, you’ll likely see the ‘common sea star’ or ‘ochre star’ (Pisaster ochraceus) clinging to the wet rocks or draped over a mussel. Sea stars usually have 5 arms, but some can have many more. One local species, for example, the sunflower star (Pycnopodia helianthoide), can have up to 24 arms! Sea stars come in an array of eye-catching colours, which like our hair colour, is controlled by genetics. The ochre star can be purple, orange or brown. The white dots that you see are actually a network of spines, giving them a hard stiff body. The mouth is located on their underside and is surrounded by thousands of little suction cup-like appendages or “tube feet”. They use these tube feet to cling to the rocks, breath and pry open their prey. Voraciously, these intertidal creatures will eat anything in their path, devouring oysters, clams, barnacles, and especially mussels. Sea stars have a very unique way of feeding. They can actually push their stomachs outside of their bodies! They use their tube feet to pry open the shells of their prey and then insert their stomachs inside them. As critical predators in the intertidal, sea stars keep everything in check. Since they are spiny and offer little meat, not much preys on them. Many sea stars are highly specialized for living both in and out of water. Keeping cool, staying moist, dealing with rainwater and predation, are just a few of the challenges that they face in the intertidal zone. Sea stars defend against the elements by huddling together, climbing under rocks, and reducing movement. So, if you see a sea star that looks lifeless, let it be—it’s just coping with the elements. Sea stars are sometimes taken home by people to be dried out and used as decorations, an unfortunate fate for such significant intertidal dwellers. 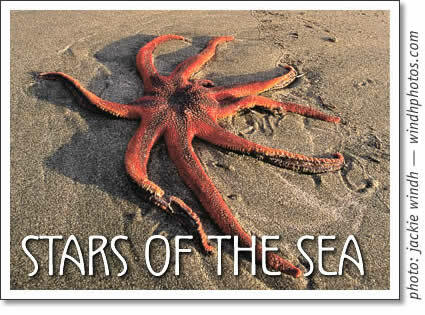 Close to a million people a year visit local beaches, imagine if everyone took a sea star home! Sea stars play an important role in the ecology of the seashore; please do not remove these animals from their homes. Bring your intertidal questions to the Raincoast Interpretive Centre or join us on our low tide seashore walks every Thursday at 10 am. Meet at the South Chesterman Beach Parking lot. $5.00 donation rain or shine, everyone welcome. Sea stars are related to sea urchins, sand dollars and sea cucumbers among other animals, all members of the phylum Echinodermata (“spiny- skinned”). Do sea stars have eyes? Kind of, they have light sensitive spots on the end of each arm, which is why you will often see their tips curled up! The off center spot on their back is not their bum, but a water intake valve that brings water into their bodies to create water tension so their tube feet can suction. Melanie Knight is a summer interpreter at the Raincoast Interpretive Center. Studying Marine Biology at Memorial University of Newfoundland, she divides her year between the Atlantic and the Pacific Ocean.